TopVue Daily contact lenses provide all-day comfort and sharp vision. They are made from a hydrogel material and are enriched with sodium hyaluronate for added moisture. Their thin edges ensure minimal friction with the eyelid. This package contains 30 lenses. TopVue Daily contact lenses are made from an innovative hydrogel material that contains sodium hyaluronate and the PEG (polyethylenglycol) wetting agent, both of which ensure extraordinary moisture and maximum all-day comfort. Sodium hyaluronate, or hyaluronic acid, is a substance natural to the human body. Besides joints and other body parts, it can be found in the vitreous humour, the interior component of the eyeball. We also offer a larger package of 90 lenses. 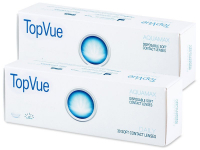 TopVue contact lenses are designed with very thin edges. The eyelid comes into contact with the lens edge whenever we blink, so if the edge is thick, we are constantly aware of the presence of the lens in the eye, so thinner is always better for comfort. 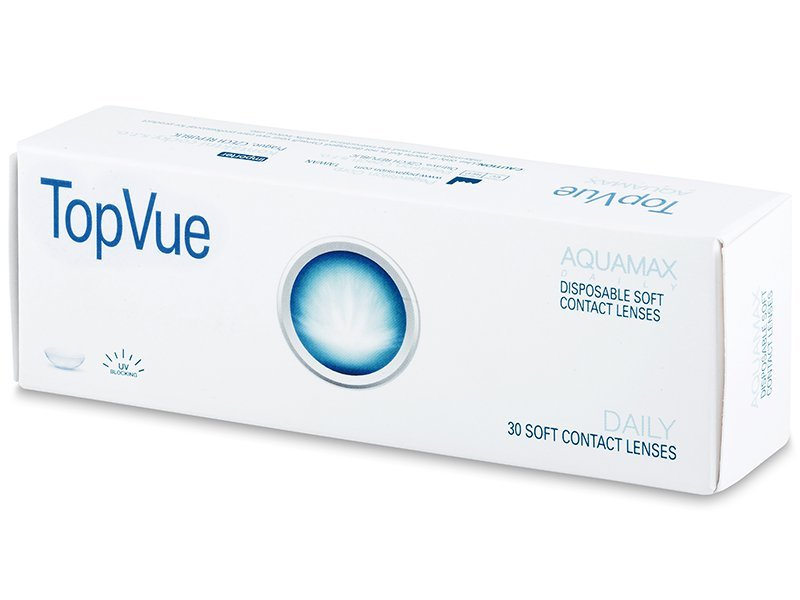 TopVue Daily contact lenses provide stable optical correction which can be especially useful when driving at night or spending many hours in front of a computer or other digital screens. TopVue contact lenses are among a few that are equipped with a UV filter to absorb harmful UVA and UVB radiation. It's important to note, however, that the contact lens is only able to cover and protect the coloured part of the eye, leaving the white of the eyeball exposed and vulnerable to sun damage. Therefore, it is always advised to supplement the protection of the contact lenses with high-quality sunglasses for effective protection. Each pair of TopVue Daily contact lenses is intended for one use only and should not be worn during sleep. Another benefit of daily lenses is that the do not need to be cleaned, so you will not need cleaning solutions, cases, or other accessories. The lenses are made of Etafilcon A hydrogel material. They contain 58% water and their oxygen permeability is measured at 26 Dk/t. Pleased with these lenses. Cheap and handy for daily lenses. Hello, do you offer any discount for contact lenses? I'm new to your site and this brand, but would give these a go if you have any offers. After my 3rd order from you, I'm consistently pleased with the lenses and the service provided. Many thanks. Cheap and comfortable dailies. Much better than the previous monthly lenses I was wearing. Wonderful experience shopping with your company. Email replies quickly and delivery swift and hassle-free. Great service. You were able to split my order so I received the daily lenses before my holiday. Much appreciated. They took some getting used to, but I'm hooked now. They feel great, and price cannot be beat. Looking forward to placing my next order. Excellent service; I'm so pleased with my service through your website. I made a mistake with my order, and it was corrected and shipped out within minutes. Thank you! So happy I made the change to daily lenses. I can't believe how much better they feel, and the price is one of the most reasonable i've seen in my research. I really recommend these for dry eyes. Daily lenses have been a lifesaver for me. I should have tried dailies years ago, but was always put off by the prices. But these are reasonable and the quality seems great. Fantastic price for daily lenses. Excellent high quality; I'm very satisfied overall. Came as a free gift with my order. Gotta admit that they are one of the better daily contact lenses. I prefer dailies because I have sensitive eyes. The problem was that this way of wearing is quite expensive... However now I am satisfied with TopVue. A lower price here does not mean less quality. Was previously using specsavors easyvison and swapped to this cheaper contact lens brand. I can honestly say they are much better! Highly recommend.